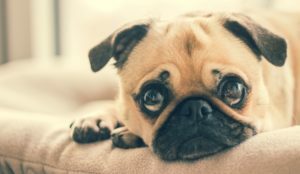 Pet Urine Accidents? Urine Luck! Is cleaning my carpets enough to remove odors from pet accidents? The short answer is “no”. Carpet cleaning by itself is inadequate at handling the odors that come from pet accidents. And steam-cleaning your carpets can make the smell worse, not better. In a nutshell, when a pet urinates on the carpet, gravity is always at work. Thus, especially with large dogs with large bladders, their urine penetrates down through the fibers, through the backing of your carpet, down into the pad, and even to the sub-floor. If you have pets, you’re going to be cleaning up their urine at some point. It’s as simple as that. Even the most housebroken pets have accidents every once in a while. And while we can forgive and forget, carpets have a much longer memory when it comes to urine–the uric salts left in your carpets after urine dries can last up to 20 years! Whenever it gets hot and humid, these salts will activate producing the urine odor. Thus, the way to attack this odor is to address every level within the flooring system with a cleaning solution that will remove the salts left by urine. What is “urine,” really? Is cat pee the same makeup as dog pee? By nature, all pee has similar components. Over 95% of urine is water, with the rest being a combo of urea, uric acid, sodium, potassium, creatinine, and a few other elements. However, all pee is not created equal! Cat and dog pee are not the same, because the difference lies in the types of hormones, metabolites, and bacteria that are specific to each animal. Cats and dogs don’t drink as much water as humans, so pet urine is much more concentrated and much more odorous than human urine. This concentration is a big deal when it comes to removing urine from your carpet! So, what’s that smell? And why can I still smell it after I clean my carpet? Mostly, it’s uric acid. Uric acid consists of nitrogen, carbon, hydrogen, and oxygen atoms. The solution crystalizes and doesn’t dissolve in water. That’s why traditional household cleaning products and steam cleaning systems are ineffective when removing pet urine. It requires much more than soap and water to eliminate uric acid from your carpet. When pets urinate, the urine has the tendency to penetrate carpet fibers, carpet padding, sub-floor, wood floor or whatever porous flooring you may have, thereby introducing uric acid salt crystals which tend to bind tightly to whatever porous surface they come into contact with. These uric acid crystals bond to these areas and are invisibly to the naked eye, showing up only when a black light is used. Since these crystals reform upon exposure to moisture or humidity (hello summer! ), the smell usually resurfaces after you think you’ve removed it. Yuck. The only way to remove the smell is to remove the uric acid completely. Is there a silver bullet for removing uric acid? Yes. The only way to remove these crystals is to destroy the chemical bonds that form uric acid. There are specific enzymes that break down uric acid into carbon dioxide and ammonia, both of which easily evaporate. Enzymes are biologically-active proteins that either cause or speed up a chemical reaction. This bio-enzymatic technology is the only way to successfully remove uric acid from your carpet. Can these enzyme cleaners be purchased for home use? Yes. The professionals at Brody’s Dry Carpet Cleaning care about your family’s health and comfort long after we’ve cleaned your carpets. 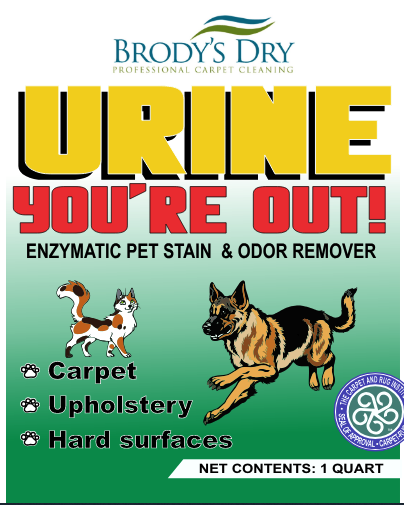 We recommend starting with a professional deep clean of pet-stained areas, and spot treating in between cleans with our NEW enzymatic cleaner, Urine You’re Out! Urine You’re Out! is a special formula only available from the professionals at Brody’s Dry Carpet Cleaning. It consists of four different families of acid-removing enzymes and is concentrated at 229 BILLION enzymes per gallon! That means it is over 3 times stronger than any enzymatic cleaner on the market! Are you ready to remove pet stains and odors for good? Call the professionals at Brody’s Dry Today!